Caster Semenya won Sports Star of the Year, Sportswoman of the Year, and the People's Choice Award. Her coach Samuel Sepeng won Coach of the Year. 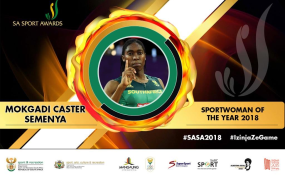 Olympic and world champion Caster Semenya bagged three major awards at the South African Sport Awards in Bloemfontein on Sunday night. The record-breaking athlete dominated the prestigious awards after winning the Sports Star of the Year' Sportswoman of the Year and the People's Choice Award decided by public, all of which were accepted by her coach Samuel Sepeng, who also received the Coach of the Year award. Semenya is also nominated for the IAAF Female World Athlete of the Year award, with long jump champion Luvo Manyonga nominated in the Male World Athlete of the Year category. The other major winner of the night was Olympic swim sensation Chad le Clos who was named the Sportsman of the Year, where he was nominated alongside WBA and Ring Magazine light-flyweight champion Hekkie Butler and Manyonga. Commonwealth Games 100 and 200m breaststroke champion Tatjana Schoenmaker was named the Newcomer of the Year where she was nominated with fellow swimmer Minke Janse van Rensburg and sprinter Luxolo Adam. Sportsman of the Year with a Disability went to Mdodozi Ntutu and Anrune Liebenberg walked away with the Sportswoman with a Disability award, while the Team of the Year award went to Banyana Banyana, who have qualified for the African Women's Cup of Nations in Ghana. The fearless and passionate Virginia Mabaso from Rowing SA continued to break all boundaries in sport and was named the Administrator of the Year, while the National Federation of the Year was taken by Softball. The SA Sports Awards aim to reward South African sports stars who participate in local and international competitions. They also recognise and honour individuals and teams who have excelled both on and off the field from 1 September 2017 until August 2018.